In 1894, Samuel South(1) 1853-1919, entered a joint venture with Charles Hastings to undertake brickmaking on land in White Hart Lane leased from John Edward Ford. The agreement is reproduced below (taken from a photocopy - transcription beneath). 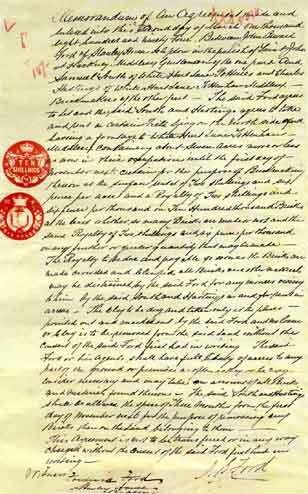 "Memorandum of our agreement made and entered this second day of March One thousand eight hundred and ninety for Between John Edward Ford of Stanley House Clapton in the Parish of St. John at Hackney Middlesex Gentleman of the one part and Samuel South of White Hart Lane Potteries and Charles Hastings of White Hart Lane Brickmakers of the other part. The said Ford agrees to let and the said South and Hastings agree to take and rent a certain field lying on the North side and having a frontage to White Hart Lane Tottenham Middlesex containing about seven acres more or less as now in their occupation until the first day of November next Certain for the purpose of Brickmaking thereon at the surface rental of Two shillings and and sixpence and a Royalty of Two shillings and sixpence on Ten hundred thousand Bricks at least whether so many Bricks are made or not and the same Royalty of Two shillings and sixpence per thousand on any further or greater quantity that any be made. This agreement is not to be transferred or in any way charged without the consent of the said Ford first had in writing"